It is common to blame the nutrient for poor growth results. However, in most cases, the true cause is poor general hygiene practices, especially the failure to regularly disinfect the nutrient solution. 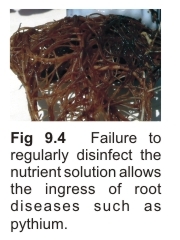 To preventdisease ingress, the nutrient solution, medium and roots should be regularly sterilized. ‘Sterilizing agents’ must yield a ‘residual’ chemical when dissolved in the working nutrient solution so that the entire system is treated each time plants are watered. Historically, chlorine dioxide, sodium hypochlorite, hydrogen peroxide and monochloramine are used for this purpose. However, monochloramine has the advantage of possessing a long half-life, is gentle on roots, and is compatible with the majority of 'organic' mediums and growth promotants. Note that hydrogen peroxide is not useful as a sterilizing agent in hydroponics because it is only effective as an oxidant when the nutrient’s pH is around 1, which is far too low for plant growth.